Mothernode CRM Sales & Marketing Edition (and above) provides an API connection to Mailchimp, enabling customers to easily add Mothernode CRM contacts to their Mailchimp lists. For more information about the Mothernode CRM API Connection to Mailchimp, please read API Connections – Mailchimp. 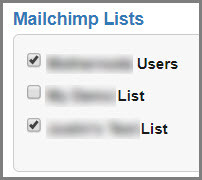 Select one or more of the available lists, and these Mailchimp lists will automatically receive the contact information when the associated Mothernode lead form is submitted by a respondent.